EEPC Group offers tailored training to our clients based on their specific needs and based on their actual environment and organizational structure. Our team provides for certified Microsoft trainers around Microsoft SharePoint, Office 365, custom development, SQL Server and Microsoft Project Server. The “canned training” of the past does not provide the true ROI that EPC Group’s tailored training provides as we can dive into your exact SharePoint 2019 or other identified environment and provide training based on your information architecture (IA) and navigation as well as the actual roles and responsibilities of your team members and end users. EPC Group provides for recordings of the training session so that you can store them online within a SharePoint training site and users can have 24/7 access to them to refer back to the training at any time. 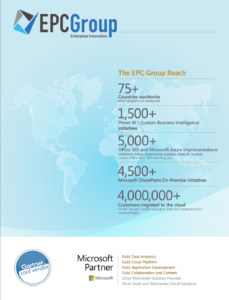 EPC Group also provides a large offering of short 3-5 minutes videos on specific topics so that users can find quick training on a specific topic which lowers your overall long-term support costs and allows IT to focus on providing solutions to users rather than continually having to training around areas that can be better addressed by providing a training video link and related material.